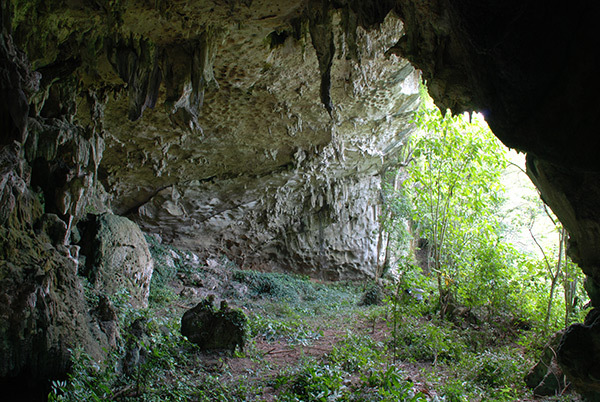 Goa Harimau or Tiger cave is located in Padang Bindu village, Semidang Aji, OKU regency, or it about 35 Km from Baturaja city. Before we reach the cave, we have to crossing the Ogan river by using old bridge, then walk along the trail for about 4 Km passing the Haman river. There are 35 of ancient human skeletons from Mongoloid race has been found at the mouth of the cave, and it already observed by the National Archeological research team (Puslit Arkenas) of Ministry of Culture and Tourism of Republic of Indonesia. Beside the human skeletons and fossil, there are also found some of high historical value such as pottery, pecan seed that has become fossilized, stone beater and stone pickaxe. It is estimated that in this cave, there were civilization originated from 2000-3500 years ago. When entering the cave we will find the ground floor of the cave that has been excavated. At the base there are numbers of human skeleton. In this cave was found 78 skeletons in various positions. Each position of the skeleton has its own story. There are couples of men and women embraced, there are also woman who with her fetuses where on the right hand there are sea shells for stock tomb. The stock tomb is the characteristic of a prehistoric human civilization.